When it comes to modern bathtubs, and entire bathrooms, caulk is king. It’s vital for sealing the grout lines between your wall and tub, preventing mold and mildew, minimizing leaks and more. This is why keeping caulk in mint condition is so important. From time to time, caulk will crack, and it needs to be replaced. To help you know when and how to handle this bathroom renovation, here’s a look at signs it’s time to re-caulk; specific areas to be on guard about; and tips for how to caulk bathtubs, sinks and other areas well. Major bathroom problem areas for caulk damage are places that are regularly wet: e.g., corners, edges, bases and other parts of the shower/tub, stand-alone shower or sink where water always hits. In the shower/tub, for example, you’ll usually spot issues along the seal between the tub and the wall. In the stand-alone shower, you might see caulk damage along the floor where the tile meets the wall. When any of these problems occur, your best bet is to remove the damaged caulk, remove any mildew/mold damage, and start again. Remove old caulk. Don’t skip this step and apply new caulk on top of old caulk! It is much harder to get caulk to meld with existing, damaged caulk than it is to put it on a fresh surface. There are several methods you can use to remove old caulk, including scraping it with a razor blade, softening it with a specially designed caulk product, or a combination of the two. You need to get the old caulk fully removed before moving to any of the additional steps. Clean the area. Use a bleach solution to get rid of any mold/mildew damage lurking beneath the old caulk, and use a cloth dipped in rubbing alcohol to wipe off the area after that. You want a fully cleaned, smoothed area to which you’ll apply new caulk. Apply new caulk carefully. Use a high-quality caulking gun to apply new caulk to the area you’re repairing. You can use either latex (easier to apply, cleans easily) or silicone (harder to apply, harder to remove). If you’re worried about messing up, feel free to put down tape, like you would when painting, to expose only the areas that should be caulked. Wipe the tip of the tube after each application. Clean and smooth the new caulk. Check for any extra splotches of caulk remaining here and there, and smooth them out with a wet finger, wiping your finger clean after each touch-up. Caulk sets quickly, so you’ll need to work fast. If it has already dried by the time you realize a mistake, use a razor blade to cut off excess. A clean and mold-free bathroom is worth the extra trouble that re-caulking requires. Use the tips above to caulk bathroom sinks, the shower, the tub or wherever you need repairs. 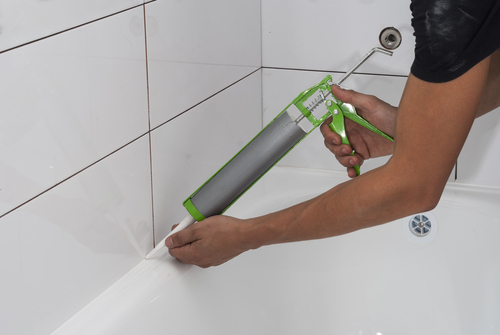 When you properly remove and replace caulk in the bathroom, you set yourself up for years of better protection from water damage. If you have questions about bathroom renovation and the products we offer, contact Modern Bathroom today!